Last week I was lucky enough to be in the old city of Rhodes on the eponymous Greek island at the time of their 'Open Doors' day. This is part of an annual event in late September that is spreading Europe-wide (in England we know it as 'Heritage Open Days'), where places of historical and cultural interest not normally accessible to the public open their doors for free. 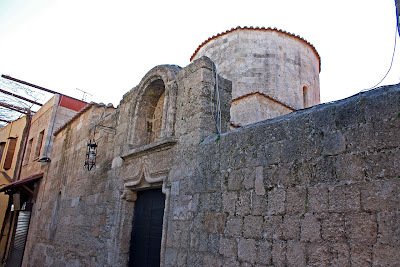 In one of the small streets of in the old town, set back behind a wall was a little Byzantine church called Agia Paraskevi. Situated in Chora, the quarter where common citizens lived, it was built around AD 1500 in the free-cross style with a dome. Inside, walls that had been whitewashed during Ottoman occupation had been partially restored to reveal the remains of colourful frescoes. 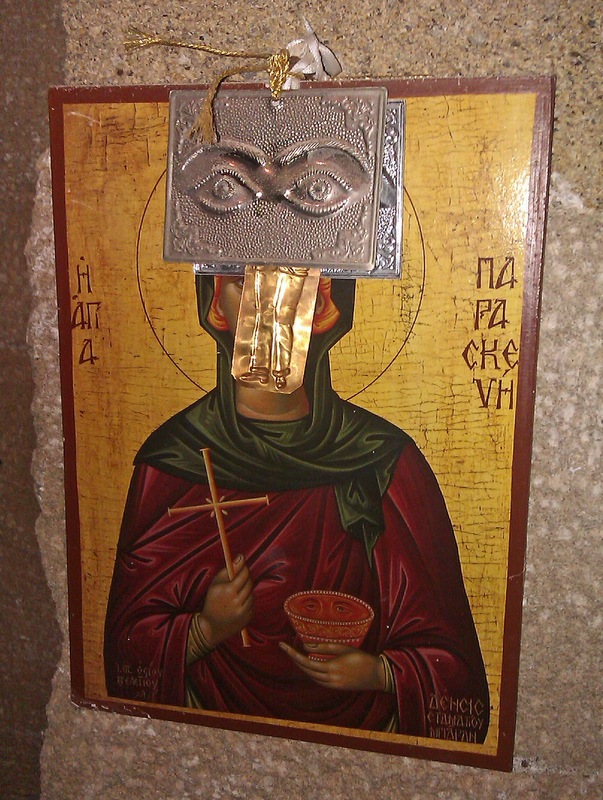 Paraskevi was a 2nd-century martyr of Greek parentage and a popular Orthodox saint. According to legend, she was brought to trial for her faith before the emperor Antonius Pius in Rome. After surviving submersion in boiling oil and tar she was accused of magic so she threw some of the mixture into the emperor's face, blinding him. She told him he could only be healed by the grace of God so when he pleaded, she restored his sight. Antonius henceforth ended persecutions agains Christians across the empire and Paraskevi became known as the protector and healer of eyes. 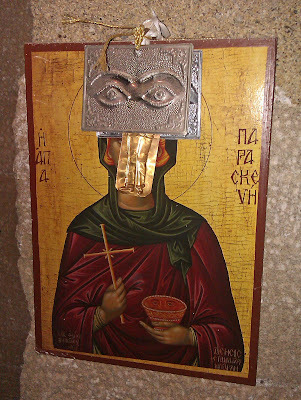 Propped up in various nooks inside the church were painted icons of Saint Paraskevi, showing her holding a cross and a bowl of eyes. Some were adorned with beaten metal ex-voto amulets of eyes and limbs, representing modern-day churchgoers' prayers to the saint to cure afflictions to that part of the body - such as blindness or paralysis. They might also have been placed there as gratitude for recovery. These were very similar to many of the metal ex-voto eyes we found in de Mortillet's collection, although some of these may have been devoted to other saints associated with blindness such as Saint Lucy. Whilst history tells of many miracles taking place at Paraskevi's tomb - the blind receiving sight, the lame walking, and barren women becoming pregnant - it is clear that the search for miracles and divine healing remains part of the Christian faith in some parts of the world through de Mortillet's era more than a century ago and on into the 21st century.